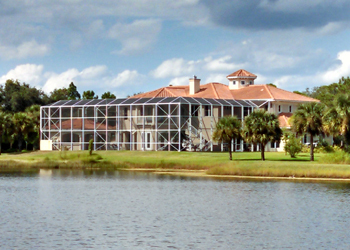 Since opening in 1993 with our sales team and installation fleet covering Brevard, Indian River and St. Lucie County, Tripod Aluminum has built thousands of enclosures for families all over Melbourne, Viera, Palm Bay and Port St. Lucie. At Tripod Aluminum, we make sure your enclosure is specifically built to fit what you need. From design to the construction itself, Tripod Aluminum employees handle every aspect. Designing everything in-house means we do not use any subcontractors, so you can be assured that every enclosure we build meets the same level of high standing quality we pride ourselves as a premier fencing company. 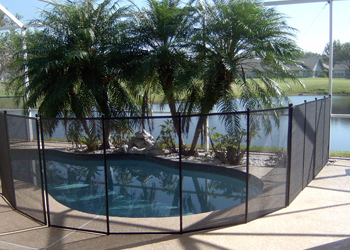 From stainless steel anchors to different types of screening, we have exactly what you need for your new pool enclosure. 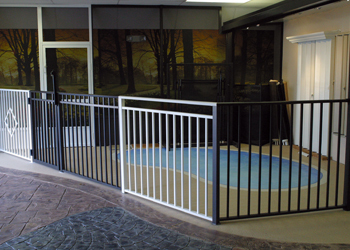 Our aluminum fences are high quality and are extremely durable in Florida’s rapidly changing environment. A screen room provides shade and UV protection, utilizing your outdoor space year round. 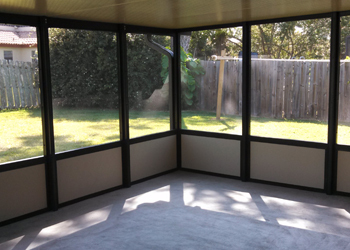 Bring your outdoor space IN to your home with an enclosure from Tripod Aluminum! Installing a baby guard is a safe and smart decision; it keeps your little ones at a safe distance from the pool. Like a pool enclosure, a screen room provides shade and UV protection, utilizing your outdoor space year round. I would like to commend the workers who did the job without supervision. I was amazed to see how hard they worked without breaks and focused on finishing the job at hand. The two young men were friendly, knowledgeable and quite adept at the job. You have a few good men on the job and they should be recognized. I was amazed to watch them work at what I thought was rather dangerous positions while working on the roof part of the enclosure. They thought nothing of it and continued on to do a good job. I don’t have any complaints, and compliment myself for selecting Tripod Aluminum after obtaining three other quotes for the job. Although Tripod was not the cheapest I do believe that it was the most professional and completed the job in just a few days. Your employees deserve some praise but I am sure they would rather have a raise! 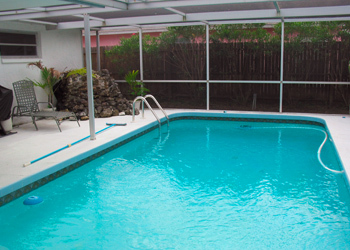 Thank you for living up to the terms and conditions of the contract for “Complete Rescreen” of my pool enclosure. We would like to take this opportunity to let you know how professional and helpful your employee, Walt, was with the installation and delivery of our shutters. I hope that all your employees will take a lesson from him on how to interact with customers. I just wanted to thank you for your installation of our Baby Guard fence around our pool. With our little guy almost starting to walk, I can’t tell you how much more relaxed we are knowing the pool is secured. It was money well spent and we couldn’t be happier with how it looks, and how safe it has made our patio. I have found that most clients are often remiss in not taking time to recognize companies who excel in providing a service. I would like to thank your staff and installers for the fantastic job of manufacturing and installation of our screen enclosure. Justin and John were very professional and took great care when doing the installation. They completed it very quickly and they left the job site immaculate. I would highly recommend your company. I was employed for over 20 years for a construction company in New Jersey. I can tell you that your product and installation well exceed my expectations! I look forward to many years of enjoyment in my new outdoor space. We would like to give our special kudos to Tony and Shawn for an outstanding job installing the accordion shutters as we as the octagonal Lexan panel. They were very courteous and performed their work in an extremely professional manner. The bad storms of last week provided us an early opportunity to test the effectiveness of the shutters and our wisdom in obtaining them. Unquestionably the right decision! We will gladly recommend your team. I’m writing to let you know what a refreshing experience it was to work with such a professional crew. The crew from Tripod was both professional and hard working from Jason introducing himself at the door to John doing the final cleanup. They worked nonstop from morning to the time they left in the evening. They also answered any questions I had concerning the pool enclosure they were constructing for us. The finished enclosure is great and far exceeds my expectations. My sincerest thanks to everyone that has worked so hard to meet my deadline. I am sure our family will truly enjoy this visit. Please contact us with any inquiries you may have, or to request a quote. One of our sales staff will get back with you as soon as possible.